KitBrix bags have accompanied me on numerous adventures. Their bombproof and organised design makes them ideal as race-day kit bags or equipment carriers. The CityBrix Backpack is a new release from the South Coast based brand; an everyday rucksack for the ultimate organisation in both work and play. I travel a lot these days; sometimes out of choice, sometimes out of necessity. After a while you become less stressed by the hassles and deadlines of international and daily travel, and you learn certain tricks to make things run more smoothly. One of those tricks is luggage… having the correct bag makes a significant difference to how organised and efficient you are when travelling. 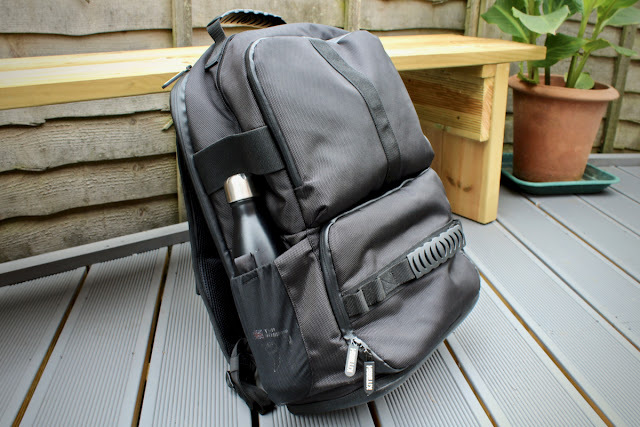 The CityBrix Backpack takes the hard bottom base, rugged water-resistant exterior, and compartmentalised design of the original KitBrix bags, and morphs it into a comfortable and practical everyday backpack. Upper storage area for notebooks, chargers, etc. 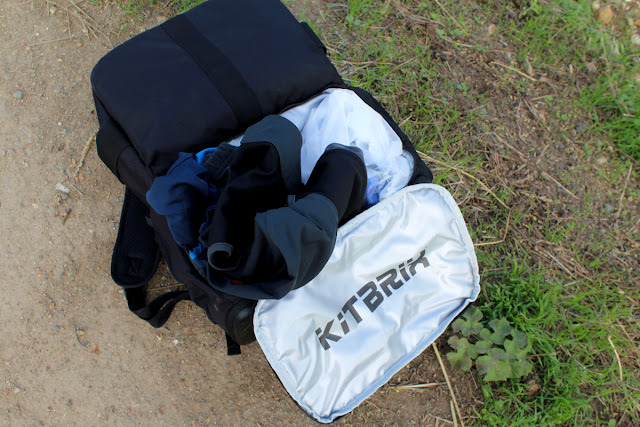 I used to own a sailing bag that had a similar wet/dry concept to this separation system, but it didn't deliver it to the level of execution that the KitBrix CityBrix does. 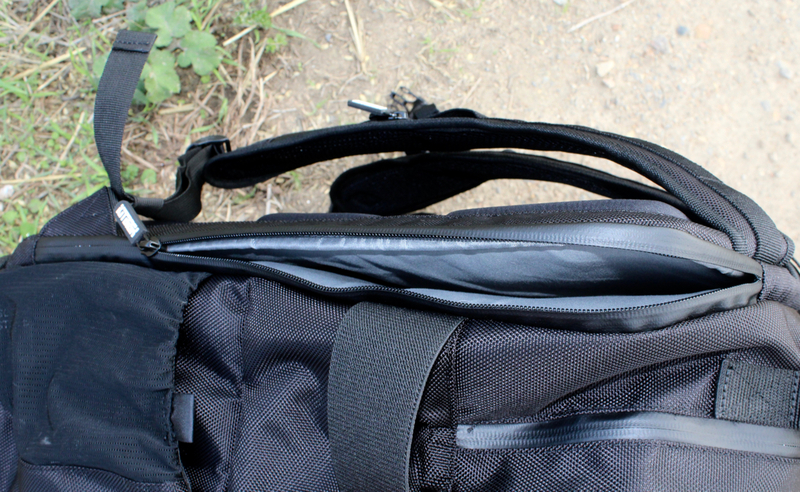 The wet compartment on this bag is completely isolated, and easily wiped clean thanks to the waterproof material. 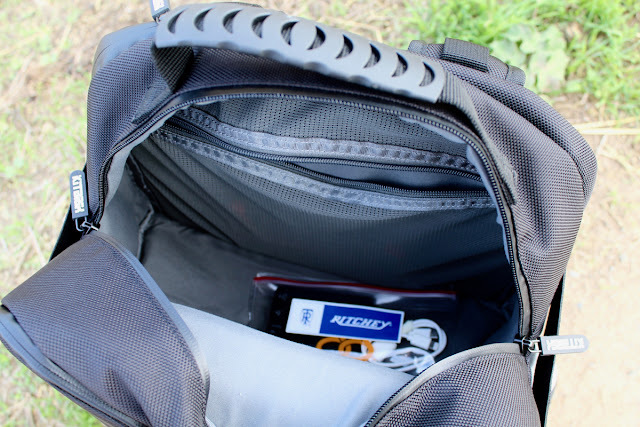 The organisation in the upper compartment is well thought-through too; with pockets for pens, wallet, keys, notebook, and other small accessories. What this bag has, which most others do not, is the hard-bottomed base. 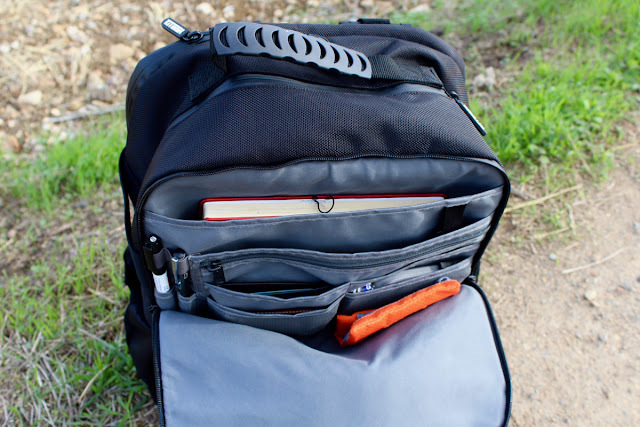 This has a number of advantages: it adds an extra layer of bumper protection for items like a laptop stowed inside the bag, and it also provides a waterproof protective layer if you were to put the bag down on a damp surface. Crucially though, the hard base adds a great element of rigidity to the whole bag. Much like with a rigid suitcase, it means that the bag is held 'open', and so items do not tend to get lost in the folds. The attention to detail in other design aspects of the KitBrix CityBrix Backpack is also impressive. On the shoulder strap for example, there is a neat little pocket designed to take a credit or travel card. On the side of the bag, the water bottle pockets are deep enough to take even a weighty sizable water bottle, and the elasticated straps are useful for wet towels or rolled-up jackets. Even elements like the bag's zippers have been considered, with water-resistant heavy duty YKK pulls. 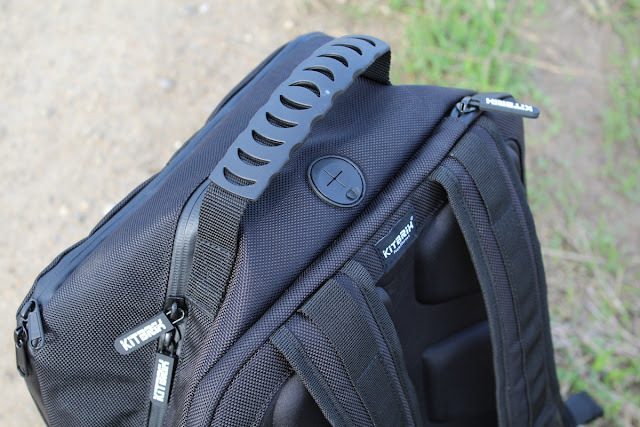 If I have one criticism of the KitBrix CityBrix backpack, it is that despite being a bag perfect for travel and commuting, it falls down in two areas. Firsty, it doesn't feature any reflective elements (it is completely black), even though there are light loops for a clip-on rear light. 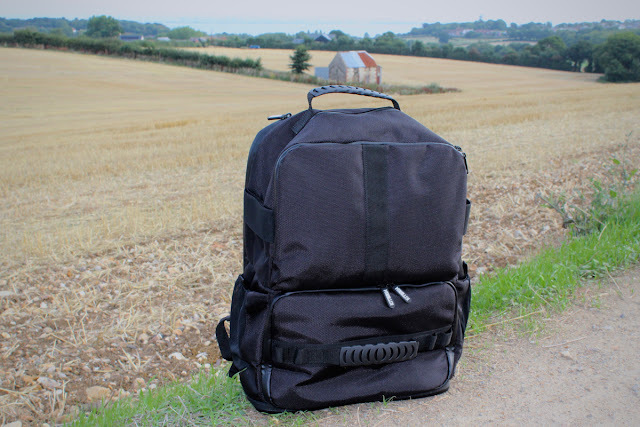 Secondly, the back panel padding is quite hard and a little sweaty in the summer months, more so than some other outdoor rucksacks. That said these are minor criticisms, and for the most part the bag is comfortable and purpose-built for outdoor travel and adventures; it certainly sits well and feels secure when riding a bike with it. 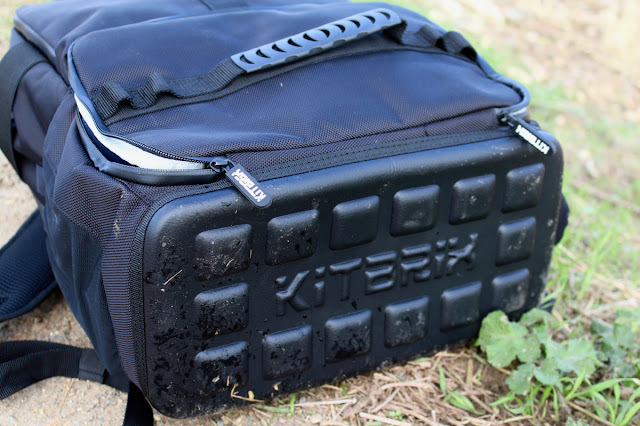 There is no doubt that the KitBrix CityBrix is a well-designed backpack. 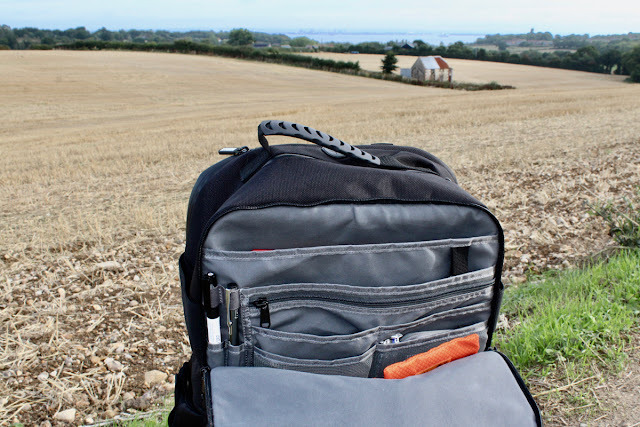 Suitable for everyday use, and robust enough to last many years of abuse; it will allow you to keep your life organised and on-track through your travel and adventures. 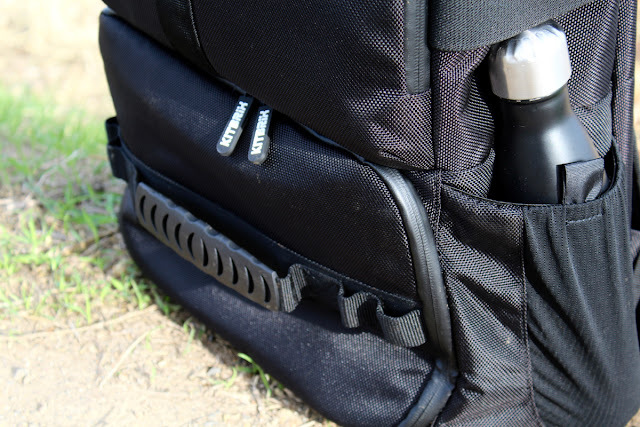 If you are the kind of person that enjoys mixing work with play; travelling light and fast, and keeping everything within hands reach, then the CityBrix is a superb companion.